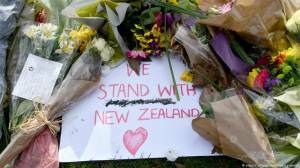 The proposed changes, to be announced at a future date, were spurred by Friday's Christchurch terror attacks, in which a shooter used multiple weapons, including military-style semi-automatic ones, to open fire on worshippers at two mosques, killing 50. Speaking at a press conference, Ardern said the attack "has exposed a range of weaknesses in New Zealand's gun laws." "I will announce a more fulsome set of details once we have worked through the decisions the Cabinet made today," Ardern said, adding that concrete proposals will be announced within 10 days. Ardern also announced that her government would launch an inquiry into the country's intelligence services. The suspect charged in relation to the attacks, a self-declared white nationalist who had posted a racist manifesto online, was not on the security services' radar. In addition to examining whether government agencies could have done more to prevent the shooting, the inquiry would also look at the suspect's travel to and from New Zealand, his activities in the country, his use of social media and his contacts. Australian police raided two homes on Monday afternoon, at two locations in northern New South Wales, close to the suspect's home town of Grafton. New Zealand would hold a national memorial to the victims of the attacks, the prime minister added. The date has yet to be determined, but it would not be this week, she said. "We want to ensure the priorities for the coming days are that families get the opportunity to grieve together."